Chatwing shares the positive feedback gathered for the premium coin system. Flexible premium advantage. It has been proven that many users love service flexibility since they are given the power to choose. The premium services are designed to be flexible so that users can gain higher leverage over using the platform. With the help of Chatwing chat software coins, the users can select the services they want. Additionally, they can terminate the services anytime. Better website exposure. 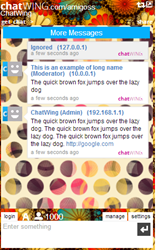 The premium features of Chatwing chatroom are created to bring the premise of website chat to a different level. The company ensures that these paid services can bring higher rates of traffic, better interaction among users, and more clients in the long run. This is the reason why many online marketers have started using the premium advantages offered by Chatwing. Inexpensive pricing scheme. For services that can improve a website’s potency by a doubled rate, users can benefit from Chatwing’s inexpensive pricing system. Each service costs 1 virtual coin per month. During transactions, a user can purchase up to a maximum of fifteen coins. Now, these coins can be accessed readily in the dashboard. Chatwing chat app will create more premium services as time goes on. With more services to choose from, web users will enjoy reaching out to people and expanding their social networks.